When ordering your bed, please order your bed with or without padding. SleepSafe® Beds are now sized and manufactured with or without padding for special needs children. Please make this determination when you order your bed. Retrofitting your bed in the future will be costly. If you order padding it will be installed at the factory and will cover ALL four sides. Padding only one or two sides is NOT an option. If you order padding with your bed it is very important to follow our recommendations by NEVER using the bed if you have removed one or more of the pads. If you remove ANY of the pads, a gap will be created between the mattress and the sides of the bed potentially creating a risk for entrapment. 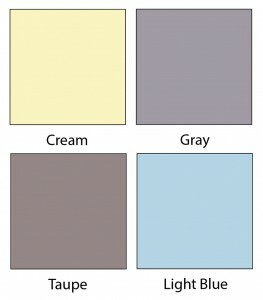 Four colors of padding are currently available: Cream, Gray, Taupe and Light Blue. You can order your bed with or without an IV Pole attachment. It comes with a mounting bracket and can be installed anywhere on the headboard or footboard. It is a 30 inch stainless steel pole with 2 ram hooks. Note: We may also be able to modify a bed to accommodate medical tubing. Please call us 866-852- 2337 for details, as each case for this application differs. You can order your bed with or without a headboard or footboard window. The need to see and be seen can be very important to both care givers and the person using a SleepSafe® Bed. We realize every situation is different so we have added the option of ordering additional windows that can be installed in the headboard or footboard. This can be especially helpful when ordering the SleepSafer® – High Bed, to allow more visibility. SleepSafer® Extension Kit Increases Safety Height another 16¾″. Through the years we have had many requests for a safety bed with additional safety height. The SleepSafer® Extension Kit maximizes the safety height an additional 16 ¾″ when fitted on top of a SleepSafer® Bed. This latest development allows a maximum of 53″ between the top of the safety rail to the top of mattress using a bunkie board with the fixed foundation. • Available for SleepSafer® Bed models only, including all foundations. • Kit may be included, as an option, with a new bed order or can be sent out as a retrofit for an existing bed. • Front and back windows have see-through tear resistant mesh fabric to increase ventilation. Screened Safety Rails Now Available on SleepSafer® Bed with Extension. The new lighter weight, screened safety rails on our SleepSafer® Bed offer improvements to the overall operation and potential comfort for the loved one using the bed. The top safety rail can now be easily attached to the above extension for easier access. 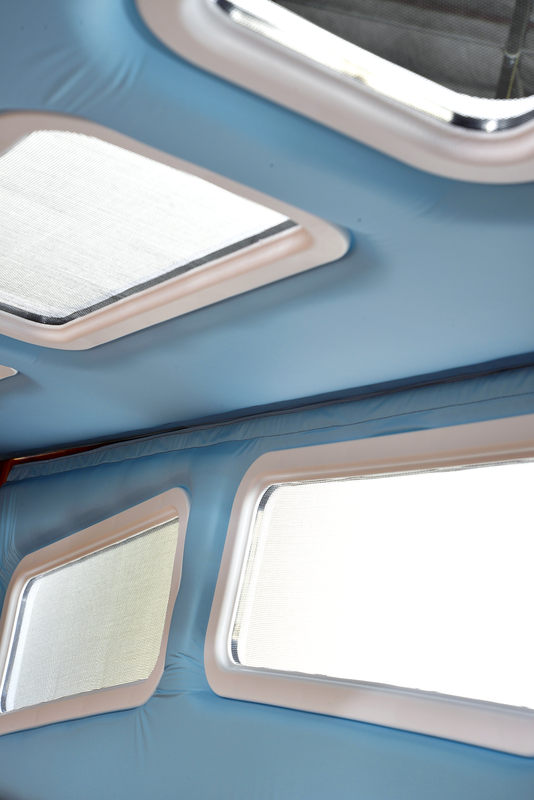 (See animation) The screened safety rails may offer improved ventilation and a cooler sleeping environment. For more information, please call us toll-free at 866-852-2337. 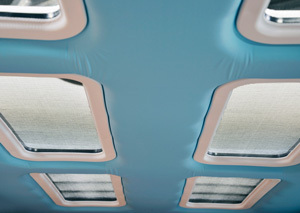 SleepSafer® Extension Offers an Enclosed Top with padding for Additional Safety. SleepSafe® Beds now offers a top that securely fastens to the SleepSafer® Extension. 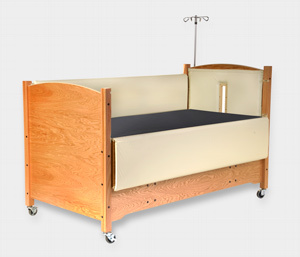 A fully enclosed bed for the most active user has been requested by our customers for years. The SleepSafer® Enclosed Extension may be ordered with the Open Extension or separately. For more information, please call us toll-free at 866-852-2337. For more information about the SleepSafer® Extension Kit, you can contact us, toll-free at 866-852-2337 or you can download or print this information. SleepSafe® Bed II with Padding around Windows and IV Pole with an opening for IV tubing. SleepSafe II Hi-Lo Bed in Oak with Pads and IV Pole with an opening for IV tubing.